Sariel was promoted to Master Archivist by her peers! It's time to go ahead. A panel of my peers was organized by Elrhan to vote on my Mastery. Elrhan apparently worked on this secretly for quite awhile before surprising me with happy news, plus this beautiful graphic to signify it, and an excellent story about the event (which I cannot share with anyone else due to copyright laws...sorry!). Anne "If the site is as good as that then she should become known as a Master Archvist" McCaffrey, aka The Dragonlady (Ireland), Expert on Pern. Period. I am, of course, extremely proud of myself, and very delighted that Elrhan organized all this for me. In the interest of further self-promotion (and to prove Elrhan wrong about my modesty--do you like my wallpaper?) I'm going to include part of his letter to me, and the letter he sent out to my peers. When we first met I told you how much I appreciated your web site and thought it was the best of its kind around. Not much later I told you that, as far as I was concerned, you were ready to walk the tables but that I wouldn't know who should do the honours since I thought and think you are the top in your field. You replied to this with your usual modesty, saying you had not been "on the job" that long and did not feel ready for promotion before you were active on the Internet for at least a year. You also felt it was up to your peers to do the honours and said you did not want to promote yourself in that way (as I said, your modest self). Reading that and getting to know your feelings in the subsequent months of mailing back and forth I made my plan of which this document is the result. My experience and my "Pern horizons" widened when I became more and more heavily involved with Pern (on the Internet) in general and some of the really dedicated persons that form that exclusive inner circle consisting of those individuals that are really MAP (Mad About Pern). Coming October it will be a year ago that Sariel the Archivist (aka Cheryl Beth Miller) started her web site Sariel's Guide to Pern (in both framed and non-framed versions). In my honest opinion as an archivist this is just one of the best (if not the best) and most extensive web site's in relation to the the Dragonriders of Pern© and their world, the world we all love. However, it is not only the website I want to honor by putting Sariel up for promotion to master status. During the time Sariel has set up and maintained her excellent website she also demonstrated her capabilities as an archivist, not only through material put on the website for us all to enjoy, but she also contributed extensively to the enlargement of insights in Pernese matters through postings on the alt.fan.pern newsgroup and through many personal email messages. She has been a staunch promotor of Pern and the Pernese since she became a journeywoman. "Now, the point is that all but one of the formalities have been observed. Admittedly, there's not been much time spent in the Hall [read: Sariel has spent only a year on the Internet], but an apprenticeship served elsewhere under a competent journeyman has always been admissible [read: Sariel was "brought to Pern" by her own father who lovingly introduced her to the books of Anne McCaffrey]". After this formality Robinton asks the assembled peers if anyone wishes to register any reservations about the competence of the journeywoman in question. Likewise I ask of you if you have any objections to the promotion of Sariel the Archivist to Master Archivist by virtue of an agreement to that fact by her peers. 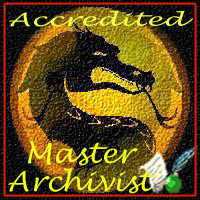 If you do agree I propose to bestow on Sariel the earlier mentioned rank of Master Archivist and the right to put the logo, depicted on the top of this letter, on her site. The traditional gift of a Master Harper's pin (complete with gemstone) unfortunately disagrees with the contents of my purse and will be hard to put on a website anyway. For a promotion to Master Harper I also propose a minimum of five agreeing peers. So besides myself at least four of you have to email me with an answer to this proposal. I'll conclude with a heartfelt thank you to Elrhan/Hans, who deviously organized all this, along with everyone else who supported my Mastery, everyone who has supported my site over the past Turn, and everyone who has simply visited and enjoyed all the hard work and long hours I've put into this website!